The Diceman Cometh: It smells funny in here. This blog details the exploits of an average gamer with average painting and modeling skills. Hopefully you will find encouragement, inspiration, and some humor. I do my best to limit my model collecting to a reasonable level of purchase. I fail, you fail, we all fail but I give it my best. I am trying this thing where I have one Xenos army, one Heretic army, and one Imperial army for Warhammer 40,000. Guess how that is working out? I will say that mostly in the Heretic/Traitor area i'm fairly focused with a growing collection papa Nurgle's Death Guard. 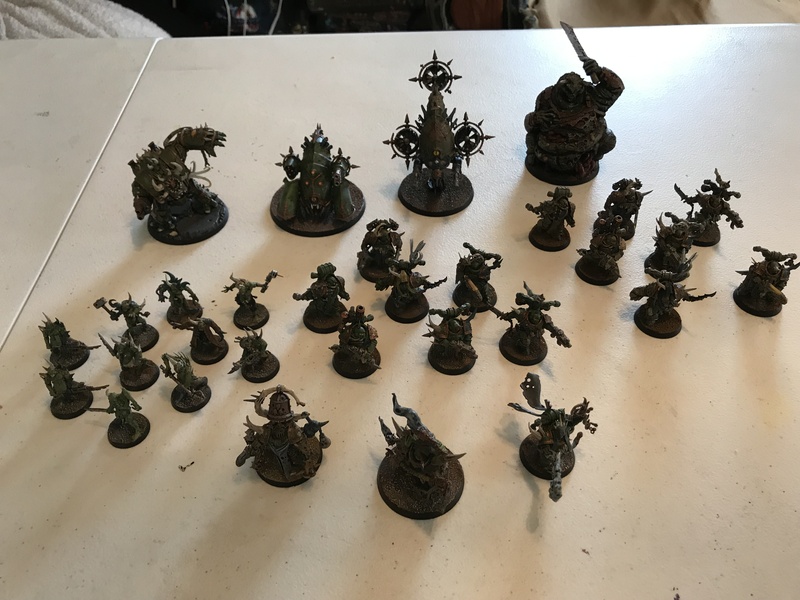 It started with the acquisition of the Dark Imperium starter and has grown with the contents of another such box, some easy to build haulers, and recently a start collecting Nurgle. Here are some low quality, badly taken photographs for you to squint at! This is the collection as it stands with plenty of nice disease filled selection of plague marines and pox walkers with a nice collection of daemon engines to back them up; hellbrute, fetid bloat drone, and myphitic blighthauler. As command structure we have a nice lord of contagion, a friendly malignant plaguecaster, a quiet noxious blight bringer, and a chubby daemon prince. I played a 700 battle versus Tyranids and they beat me soundly. We played points, but we used open play cards, then he didn't think it would be fair for me to summon daemons, THEN it was double objective twist, THEN there was no way in hell I could score either of them. LOL! I did few casualties, lost most of mine, and ultimately looked the fool. I still had fun though and got some of a read on how to play this army. If its open play daemons are absolutely on the table. Have fun with Nurgle, it's an enjoyable army (at least I found it was). That is what I tried to tell him, lol, but I think he really liked the beating he was handing me. I'm looking forward to more games with them. KNIGHTS OF THE ROUND TABLE! I'm a middle aged war gamer of moderate skills married to a beautiful woman. I have three wonderful kids and God has blessed me greatly.